Kevin Bell’s oil, “Mountains,” on display this month at the Durango Arts Center Library, shows the painter’s use of blank space to emphasize what he decides to depict. It is part of his “Land Objects” series. 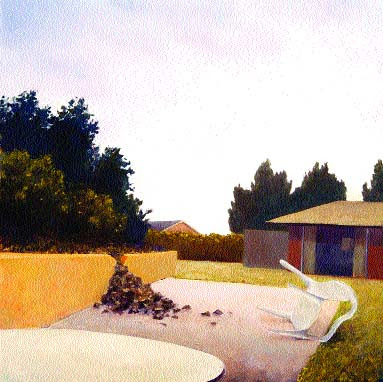 Bell’s “Domestic Disturbances” series of paintings emphasizes the calm of suburban life by contrast with a disturbance as in “Patio Chair,” looking at cracks appearing, in this case literally, in the suburbs. In “Transformer Fire,” Bell once again explores discord in a heavily manicured environment. Kevin Bell explores the tension between man-made and natural environments, the intersection between natural forms and human activity in two series of paintings currently on display at the DAC Library Gallery. “Disturbed Lands,” an exhibition of painting by the Assistant Professor of Art at Fort Lewis College, features work from the series “Land Objects” and “Domestic Disturbances” and is an exhibit not to be missed. Bell’s paintings are some of the finest work shown in Durango and deserve more than the cramped spaces of the library. These paintings should be hung in the main gallery with lots of breathing space, because Bell is a world-class artist. Bell’s paintings have been shown in New York, Chicago, San Francisco, Hamburg, Germany, Seoul Korea and Vancouver, British Columbia, where Gallery Jones represents him. His work has been accepted in the slide registry at the Painting Center in New York, and he was featured in New American Paintings in 2003. For those who don’t know, these are honors most Durango painters are not likely to achieve. Bell achieves tension between the human and the natural in his paintings without human forms. Instead, he leaves large swatches of the canvas blank, painted white in “Land Objects.” A painting called “Mountain” features a realistically painted outcropping of land, carefully carved rock, clumps of green bushes and a wire that stretches across a highway with bright red-orange spheres used to help helicopters and planes navigate. In Bell’s painting, the asphalt and sky are missing. The subject of the painting is just this object of land jutting into the canvas, an incomplete vista, a fragmentary piece of information. It’s an intentionally incomplete picture. Bell’s paintings attempt to capture the way we experience our surroundings, selectively, filtered, not as a whole, but a collection of specimens. And, these memories tend to feature a man-made element like the red-orange balls or the way the earth is cut into and shaped. In “Parking,” all we see are the empty plotted spaces filled in with bushes and landscaping bark, a giant light pole. There are no cars. No yellow stripes, just elements that are oddly human, oddly natural. Three paintings in this exhibit are from the newer “Domestic Disturbances” series. This work has an Edward Hopper feel to it, bleak and simple. The paintings are flat with compositions that are off-kilter, their horizon lines seldom straight. The colors are muted and dull, and provide a pastoral quality. 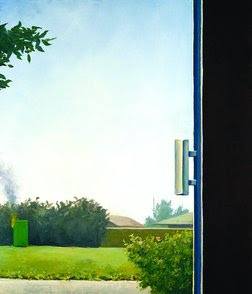 These are neat, controlled suburban landscapes, but in each painting: “Patio Chair,” “Transformer Fire” and “Fallen Tree,” something is wryly amiss. These disruptions in the otherwise tame world provide the viewer with a jarring reminder of how unpredictable life really is. Not only can we not control nature, but in “Transformer Fire,” we realize we cannot control anything. Bell understands nature. He earned a masters in environmental studies several years before earning his masters of fine art in painting. Edward Hopper believed that nature and the contemporary world were incoherent. Bell believes that nature and human activity are oddly interdependent. Where Hopper focused on the incongruent in his work, Bell attempts to paint a more conciliatory tension between humans and nature. “Disturbed Land,” oil paintings by Kevin Bell, 10 a.m.-5 p.m. Tuesday-Saturday, through Feb. 29, Durango Arts Center Library, 802 East Second Ave., 259-2606.